The largest recruitment process of the year which is the IBPS CLERK Prelims Exam 208 is happening tomorrow and aspirants will be in the last minute preparation to crack the exam. The long hours of study, the multiple discussions, the shortcut tricks learnt will assist the aspirants to a greater extent and all these things play vital role in deciding the number of questions to be attended in the IBPS CLERK Prelims Exam 2018. The total number of Vacancies available for the IBPS CLERK Exam 2018 is 7275. 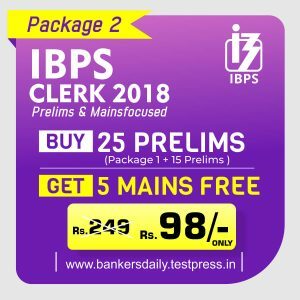 The Prelims Exam of the IBPS CLERK 2018 will happen on 8th, 9th, 15th & 16th December 2018.Totally 19 Banking Organizations are participating in this year’s IBPS CLERK 2018. The Number of vacancies has slightly decreased when compared with the previous year. 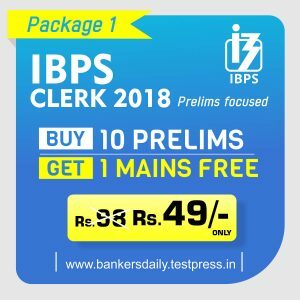 The organizations which are participating in the IBPS CLERK Recruitment 2018 are Allahabad Bank, Andhra Bank, Bank of Baroda, Bank of India, Bank of Maharashtra, Canara Bank, Central Bank of India, Corporation Bank, Dena Bank, Indian Bank, Indian Overseas Bank, Oriental Bank of Commerce, Punjab National Bank, Punjab & Sind Bank, Syndicate Bank, UCO Bank, Union Bank of India, United Bank of India, Vijaya Bank. Before diving into the details about the Last-Minute Tips for the IBPS CLERK Prelims Exam 2018, you need to check this checklist and please make sure you have these essential things which are needed tomorrow for the Exam. 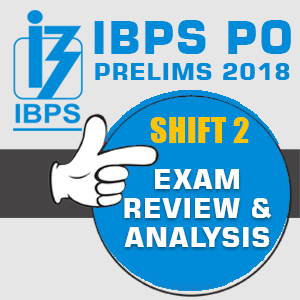 We will be bringing the LIVE REVIEW VIDEO OF IBPS CLERK PRELIMS EXAM 2018 – Shift 1/Slot 1 – December 8, 2018, at exactly 10.A.M Tomorrow. Aspirants would have prepared in an immense manner and picking the right questions is the key in the IBPS CLERK Prelims Exam 2018. Attend the Questions which are easier, and which takes less amount of time. Don’t get stranded at a question as said before, picking the questions is the important factor which decides the total number of attempts. Don’t limit yourselves with limitations. Please attempt the maximum number of questions as this is the next important thing t score more marks. Aspirants normally think of the previous year cut off marks and some tend to limit themselves for several questions. Try to read all the questions first. Then picking the right questions is an easier task. Only after we come out of the Exam, many aspirants would feel for not attempting an easier question. So, the first thing to do while attending the question is to check all the questions. Try to concentrate more on your weaker sections. 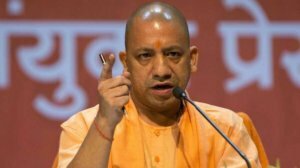 For Example, if English is your weaker section and getting marks is difficult in that section, please provide the necessary time to score sure shot marks in that section. Don’t waste your time doing the hard problems and questions. Again, choosing the right questions to score is the key. The individual cut off marks for different sections will be less when considered according to the previous tests. So, try to maintain and score more marks in the section in which you are stronger. Attending more questions in the known section will help you to boost your overall score in the IBPS CLERK PRELIMS EXAM 2018. 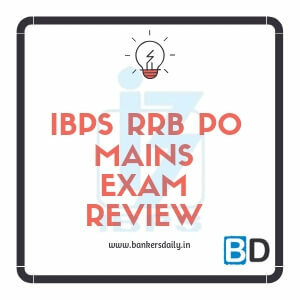 Remember scoring maximum marks is the only way to crack the IBPS CLERK PRELIMS EXAM 2018 (which absolutely depends on the difficulty level of the Questions). Whatever may be the difficulty level be calm and composed, if it is difficult for you, then the same questions will also be difficult for others, so don’t panic in any situations. The last one will be a general one. Please go to the exam center on time as we cannot speculate about the events which will happen at that time. So plan your travel accordingly, take necessary photocopies of other Original ID Proofs because if by chance when one proof is not accepted due to some reason, you can show the next one as ID proof and this will be the best way to deal the situation rather than to panic at that time. The next biggest question will be what to wear, Is there any restriction while attending the IBPS CLERK PRELIMS EXAM 2018. 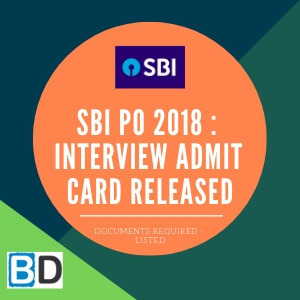 All the necessary details will be available in the Call Letter of the IBPS CLERK PRELIMS EXAM 2018, so read that one now. Most of the exam centers will be strict in the timings, so keep that in mind. Remember, you have prepared well for the IBPS CLERK PRELIMS EXAM 2018 and you are going to crack the prelims by scoring the maximum number of Questions. Always motivate yourself. All the good things will happen on the predestined time. online application form) affixed thereon. (ii) Photo identity proof such as Passport/PAN Card/ Driving License/Voter’s Card/Bank passbook with photograph/Photo Identity Proof issued by a Gazetted Officer (on official letterhead) or Photo Identity Proof issued by a People’s Representative (on official letterhead)/Identity card issued by a recognised college/University/Aadhar card with photograph/Employee ID in original as well as a photocopy. • Please note that Ration Card and Learner’s Driving License will not be accepted as valid ID proof. notification/their original marriage certificate/affidavit in original.